Black is such a happy color. 1. A cat-skeleton candle so you can see what it looks like on the inside with only a wee bit of a mess. Get it from Hot Topic or Amazon for $33.99+ (available in gray, pink, and black). 2. A graphic pillow case that'll make you feel like you are home again. But don't call Robert Smith goth! 3. 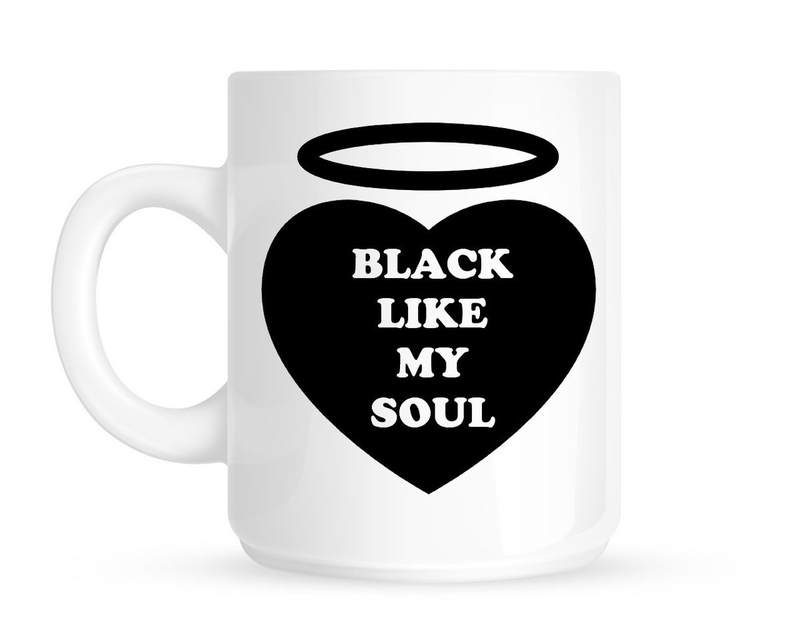 An approps coffee mug for each hand because you like your coffee black, just like your metal. 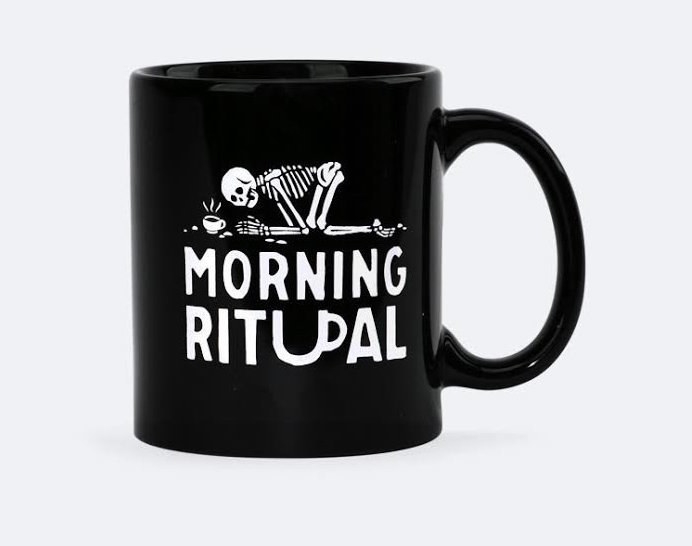 Get them from Shop Nylon: black like my soul for $20 and morning ritual for $16. 4. 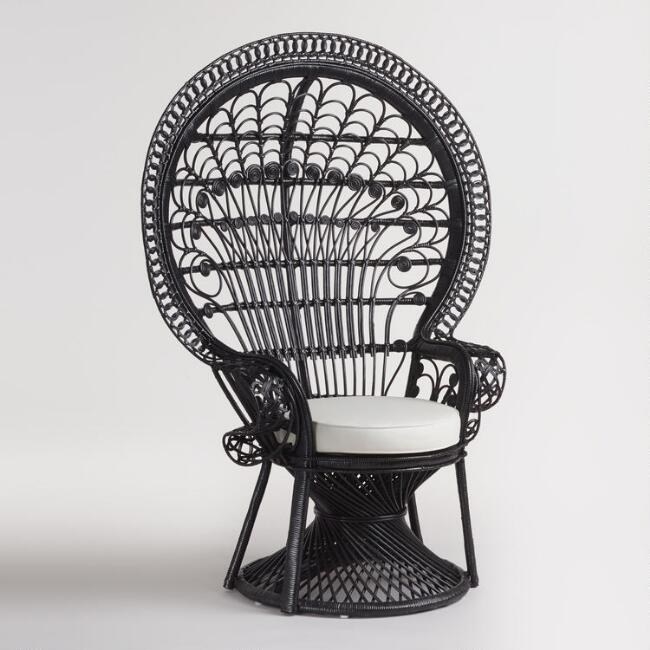 This wicker peacock chair that's just like Morticia Addams's -- except black! Get it from World Market for $399.99. 5. And a budget-friendly(ish) ~ghost~ chair in the style of Phillippe Starck that won't leave you throwing a wake for your bank account. Get it from Amazon for $55.74 (available in eight colors). 6. This planchette soap for your bathroom that no one's actually allowed to use. It's formaldehyde-, and phthalate-free, color with activated charcoal, 100% vegan and smells like pumpkin pie! Get it from Black Craft Cult for $15. 7. And an Ouija tapestry to deaden up a wall. Get it from Amazon for $38.70+ (available in three sizes). 8. Some bird-skull drawer pulls to bring that hand-me-down dresser over to the dark (but also shiny) side. Get them from BlueBayerDesignNYC on Etsy for $14 each (also available in gold bird skull, gold human skull, silver human skull, ram skull, bat skull, and anatomical heart). 9. 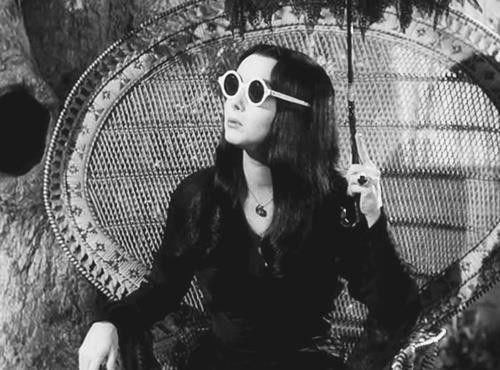 A dreadfully darling chandelier to cast some light, but not too much light. Get it from Amazon for $71.46 (also available in pink and white). 10. A set of nine tiny handy push pins that beckon to you from within the walls. Get them from Amazon for $16.95. 11. An ethereal bed canopy compatible with any kind of headboard or bed frame. Get it from Amazon for $40.24 (also available in black and white). 12. A spooky doll-head planter for an on-trend marriage of the (faux) dead and living...unless you wanna fill it with a faux succulent! Get it from RedwoodStoneworks on Etsy for $22+ (available as a tea-light holder or planter). 13. A black-cat jewelry stand that looks ~familiar~. Get it from Amazon for $14.82. 14. A black Crayola set you can use to decorate posters, prints, or just the inside of a drawer. Get them from Hot Topic for $7.92. 15. This lace valance with skulls and bats that'll look equally at home on a window or mantel. Get it from Sin in Linen for $39. 16. An eight-pack of gray towels because you and I both know mascara and eyeliner are going to get all over them anyway. Get them from Amazon for $25.99+ (available in seven colors). 17. A rib-cage fridge magnet that's vegan-friendly. Get it from Right2BearCharms on Etsy for $19.99. 18. This tiny coffin for warding off potential thieves from some of your most valuable possessions. 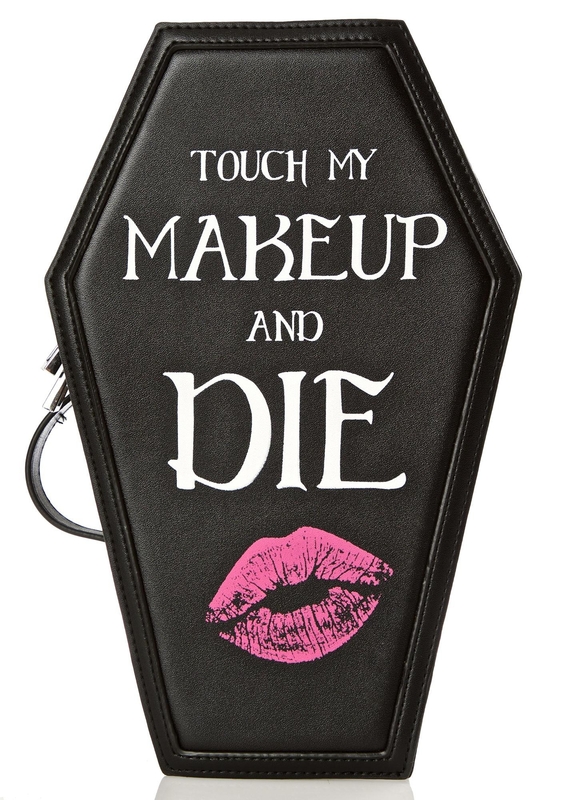 Get it from Dolls Kill for $22. 19. These glam kitchen mitts you won't mind hanging from a hook on full display. Get them from Peacock Craft Shop on Etsy for $22.25. 20. A 500-pack of faux rose petals to set the mood for your ~immortal~ love. 21. A pair of ghostly deer antlers -- that were naturally shed -- for a killer tablescape. Get them from ThEeRabbitHole on Etsy for $75. 22. This fleece throw featuring a skeletal Sailor Moon. Get it from StuffoftheDead on Etsy for $34.99+ (available in three sizes). 23. A tombstone pillow you can actually enjoy before you're six feet under. Get it from Killin' Me Softly on Etsy for $35. 24. This bloody bath mat as a reminder to clean up after all your messes. Get it from Amazon for $19.22. 25. Some slightly morbid felt-ball garland perf for all kinds of celebrations! Get it from Amazon for $18+. 26. An ash tray equipped with tormented souls taxed with catching your ashes (or loose change) for all eternity. 27. And a The Mountain Goats "Goths" vinyl that isn't ~technically~ goth decor, but is v good and carries the name in title. Get it from Amazon for $20.74 (also available in MP3 and CD).